Border Talks on Tap as 'NAFTA' Leaders Meet in Mexico President Bush meets with Mexican President Vicente Fox and new Canadian Prime Minister Stephen Harper in Cancun, Mexico, for talks. Immigration and border security -- and the balance between the two -- are expected to dominate the two days of meetings. President Bush meets with Mexican President Vicente Fox and new Canadian Prime Minister Stephen Harper in Cancun, Mexico, for talks. Immigration and border security — and the balance between the two — are expected to dominate the two days of meetings. 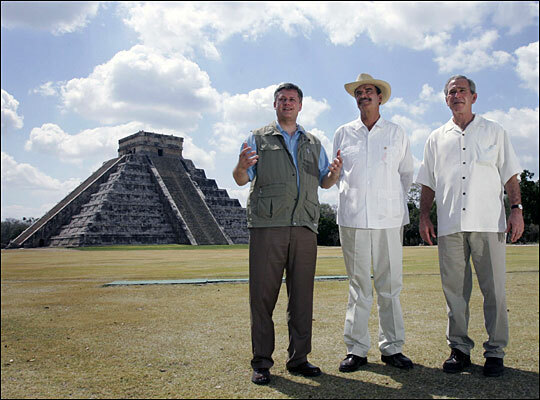 U.S. President George W. Bush (from right), Mexican President Vicente Fox (center) and Canadian Prime Minister Stephen Harper tour the Chichen-Itza archaeological ruins in Mexico on March 30, 2006. President Bush and the leaders of Mexico and Canada are focusing on immigration as they meet today in Cancun, Mexico. It's the final day of a two-day summit. The President wants to make it legal for more immigrants to enter the United States from Mexico with a guest worker program, as he describes it. President GEORGE W. BUSH: We don't want people sneaking into our country that are going to do jobs Americans won't do. We want them coming in in an orderly way, which will take pressure off our borders. INSKEEP: Currently, there are an estimated 12 million illegal immigrants in the United States, half of whom are Mexican. During the first day of the summit yesterday, the President held one-on-one meetings with Mexican President Vicente Fox as well as Canada's Prime Minister Stephen Harper. We're going to go this morning to NPR's White House Correspondent David Greene who drew the assignment of going to Cancun. David, good morning. INSKEEP: And let's start with Canada. This was the first time the President has met with Prime Minister Harper, right? GREENE: It was. And when Harper became prime minister, he vowed to have a better relationship with Mr. Bush than his predecessor, Paul Martin, did. But as it turned out, the same issue that strained relations between Mr. Bush and Martin made things a little testy yesterday. It's softwood lumber. It might not make headlines in the U.S., but the Canadians follow it very closely. The issue is tariffs that the U.S. government imposes on Canadian lumber companies dating back to 2002. It's cost Canadian firms somewhere in the neighborhood of $4 billion. The U.S. says the tariffs are necessary, because the Canadian government essentially subsidizes its producers. The Canadians think the tariffs are unfair and they want them done away with. And Harper emerged from the meeting with Mr. Bush sounding pretty tough. I think we have some tape of him here. Prime Minister STEPHEN HARPER (Canada): I just reminded the President that Canada's position is very clear. If we don't see a resolution, Canada is certainly going to continue to pursue all its legal options as well as enhanced support for our industry through this battle. INSKEEP: Tough talk from Canada's prime minister. What did President Bush say? GREENE: Well, Mr. Bush said he told the prime minister does want a solution, but he didn't really give a hint as to when that might be coming. This is how the President put it. President BUSH: The prime minister of course was, made an emphatic case for softwood lumber, and I appreciate his steely resolve to get something done. And I assured him that our intention is to negotiate in good faith, in a timely fashion to resolve this issue. GREENE: And that was about all the President could promise for now, it seems, Steve. INSKEEP: Okay, steely resolve over softwood lumber by both sides. Let's move on to the United States and Mexico here. Far more emotional issue, of course: illegal immigration. GREENE: Indeed. Since 2001, Fox has been really pushing Mr. Bush for some sort of guest worker program. As you know, the Senate is in a tough debate right now over the issue. And reality really hit here. Both leaders, both Fox and Mr. Bush, essentially said it's in the hands of Congress. There's not much they could do. The President told Fox that the debate may be cumbersome in Congress but that this is how American democracy works. So he couldn't give him any indication that he's going to be able to deliver anything for him at this point. INSKEEP: Okay, so they're still meeting today. What's left to say? GREENE: Well, the three leaders are going to talk about the Security and Prosperity Partnership. It's a new agreement they signed in Waco, Texas last year when they held their last meeting. They cooperate on border issues and environmental issues. And one thing that they're going to talk about is also figuring whether or not they need to keep meeting every year, whether they're going to put it off and meet just periodically from now on. INSKEEP: I suppose some motivation to keep meeting is you get to go to places like Cancun, and I understand the President did some tourism yesterday. GREENE: He did. He and the two leaders visited some ancient Mayan ruins. You know, Steve, the President took a lot of flack when he visited India last month for not going to the Taj Mahal. A lot of Indian officials were a bit offended and surprised that he didn't do that. White House officials say this is the beginning of a concerted effort by Mr. Bush to show that he can be a tourist and that he really is interested in getting a taste of the culture and history when he lands somewhere else. INSKEEP: Who would have expected that a President would get in trouble for focusing too much on work? INSKEEP: NPR White House Correspondent David Greene with the President in Cancun, Mexico. Thanks very much.